The Vienna Policy Conference, October 29-30, 2015, will delve into one of the most important trends driving change in European politics: the dramatic drop in public trust in many political institutions. Policy researchers, activists, leading European thinkers, and political figures will discuss new research and analysis of the causes and consequences of the trust gap across the European continent. Debating Europe and openDemocracy will be covering the event and its follow-up, and we continue the series with the thoughts prompted for Carlos Delclós – sociologist and 15M movement activist – by what happened in Ankara. 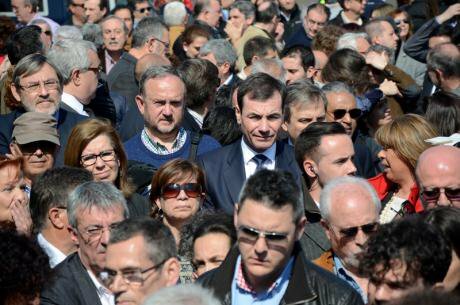 Spain recalls Madrid train bombings on tenth anniversary, March 2014. Demotix/Jorge Sanz. All rights reserved.On Saturday, Oct 10, over one hundred people were killed at a peace rally in Ankara by suicide bombers. It was the worst terrorist attack ever recorded on Turkish soil. The rally had been organised by trade unions in favour of peace between Turkish state authorities and the Kurdistan Workers’ Party (PKK), with support from the Peoples’ Democratic Party (HDP). In the aftermath of the attack, the Turkish prime minister’s office banned media coverage, citing “security reasons”. Meanwhile, Twitter and other social media went down. Despite these obstacles, some local media groups disobeyed the ministry’s orders and many people accessed social media through virtual private networks (VPN). But this post is not about the terrorist attacks in Ankara. It is about a concept people are calling “political trust”. It’s the kind of thing that gets undermined when politicians routinely refer to their opponents as “terrorists” to score political points, or when the state’s initial response to an atrocity is to do its best to restrict access to information, citing a vague logic of security. It is tempting for Europeans to believe that this response is specific to Turkey’s singularly authoritarian regime, that such a heavy handed approach is unlikely in EU member states. This is not only racist, but false. After the Madrid train bombings on 11 March 2004, which killed 193 people and injured 1,858, the Spanish government, led by José María Aznar’s Popular Party, lied to the Spanish people to make them believe that the attacks had been perpetrated by Basque Country and Freedom (ETA), when they knew it had been carried out by Al Qaeda. Like the attack in Turkey, these took place in the buildup to general elections. The Aznar government’s story was intended to maximise electoral profit. This was not even the most recent case of the Popular Party referring to its opponents as terrorists. When the remarkably successful Spanish Mortgage Victims’ Platform (PAH)—a social movement known for its peaceful civil disobedience—responded to the Popular Party’s rejection of its massively supported citizen-initiated legislation by holding protests outside the homes of politicians, several Popular Party officials repeatedly referred to protestors and their spokespeople as “terrorists” or “Nazis” in the media. They have taken a similar approach in their dealings with the upstart leftist party Podemos, constantly accusing them of harbouring sympathy for ETA. Interest in the concept of “political trust” is likely rising as a result of the wave of protests that have taken place over recent years in Tunisia, Egypt, Greece, Spain, Turkey or Brazil, which are usually linked to some form of disaffection resulting from a combination of unpopular legislation and corruption. In the light of these protests, the question that is often posed is that of what might be done to restore political trust…? But, posed in this context, doesn’t the question assume a narrow definition of political trust, one that equates it with trust in political institutions that are unable to confront the material realities they are embedded in? What if we consider political action—and trust is very much an action—as something that exists beyond the reach of formal institutions? In most of the countries that saw large-scale protests, broad movements generated a considerable amount of political trust between ordinary people who organised themselves around a common set of needs that were not only left unmet by the state and supranational institutions, but sold off for the benefit of private interests. On many occasions, states have responded by trying to destabilise these bonds through slander and coercion. But these efforts should be seen as a sign of states’ lack of social legitimacy; a lack of trust in politicians or political parties is merely a symptom of this. To illustrate this point, let us return to Ankara. According to eyewitnesses cited in the above mentioned article in The Guardian, ambulances could not immediately reach the scene of the attack because police were obstructing the quick evacuation of the wounded from the square. The video below appears to support those accounts, showing protestors confronting police to open up a corridor for the ambulance to go through. Again, the people demonstrate a trust in one another that, in their opposition to State security forces, is profoundly political. Perhaps it would be wise to build on the bonds emerging there, among the people in the swarm, between those people and the workers in the ambulance, rather than rely on the bonds being broken by the retreating police. It could very well be that the question is not why people trust formal institutions less, but why those institutions don’t trust them more?